Calling all providers and caregivers! 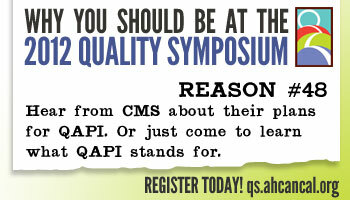 Get your quality time in early this year at the 4th AHCA/NCAL Quality Symposium on February 23 – 24 in Houston, TX. This year’s symposium is designed to provide a broad spectrum of programming to quality practitioners at all levels. We’re excited to announce that Marilyn Tavenner, administrator for the Centers for Medicare & Medicaid Services, will deliver welcoming remarks to attendees. You can find out what the Quality Symposium is all about via our informational video message from Dr. David Gifford, Vice President of Quality and Regulatory Affairs. In addition to earning 14 CEUs, participants will learn about hot topic areas related to reimbursement and AHCA/NCAL’s new quality initiative. Are you planning on attending the symposium? Let us know. If you’re tweeting about it, be sure to use the symposium hashtag #qs2012. This week in the New York Times, reporter Sam Roberts highlights nursing homes as a readily available, low-cost solution to post-acute hospital care. With a large population lacking health insurance, legal documentation or both, New York City faces the problem of patients languishing in hospitals for care that they could otherwise receive at a lower cost in nursing homes or rehabilitative care settings. But even if Medicaid pays for some care, taxpayer dollars are ultimately being consumed by patients who could be cared for in nursing homes or other health facilities, and even at home if supportive services were available. Care for a patient languishing in a hospital can cost more than $100,000 a year, while care in a nursing home can cost $20,000 or less. The case of New York City is a microcosm of a larger issue facing the country. Other states with large immigrant populations like California and Texas face similar predicaments with where to send patients that lack documentation and/or resources for discharge to a long term or post-acute care setting. And with hospitals reluctant to “dump” nonpaying patients, and politicians steering clear from changing reimbursement formulas that could be seen as benefiting illegal immigrants, the issue continues to persist. In an era of continuous cuts to Medicaid that affect patients and health care providers alike, AHCA continues to promote nursing facilities and rehabilitative care centers as the cost and quality solution to long term and post-acute care. If you’re facing a similar issue in your state, tell us about it in the comments section.